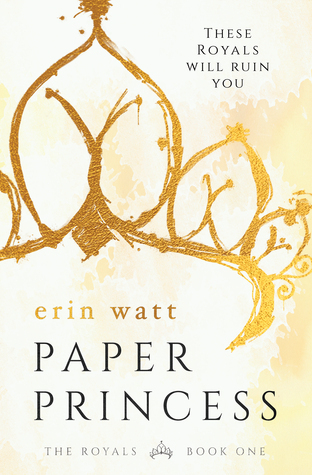 Paper Princess is the first book in Erin Watt’s The Royals series. I found this book in the Young Adult department in my local bookstore, although I would recommend this book for New Adult readers too. I have to say, I don’t make as much time to read lately as I would like to. But this book, it had me reading all 364 pages in one day. A book that I would certainly recommend, certainly if you are looking for a story that is nothing like a typical YA book. “Somewhere along the line, I started thinking that if I just got through this bad experience, this bad day, that tomorrow I’d have something better, brighter, newer. Like I wrote before, I really liked reading this book. It had me glued to the pages. It is like that one series on tv, the one you know that isn’t a great one because of all the drama, but you keep watching it anyway. A guilty pleasure. We all need books or tv shows like that once in a while. This book did have plot twists I definitely did not see coming. I really liked the characters, which is kinda weird to say because all the characters in this story are ‘broken’, like I said, a lot of drama. But the authors did a really great job of bringing them to life. Even when their emotions were all over the place and I did not understand their actions, for some reason I did understand them. I know that doesn’t make sense, but I think to understand you just have to read this book.